The rope loops down, through the harness and up to re-trace its path through the knot. Up. Right. Down. Left. Up again, parallel to the rope hanging off the rock. Pull it tight, dress it right. My hands weave through motion almost without thought, as repetition has trained them to do. If only other areas of my life were trained so, by repetition, until I always knew the right way to go without conscious thought. So sure of each motion, like this knot. It holds my life, this knot. But I never doubt it. Not because of my ability in tying, but because I trust whomever, much wiser than I, knew this was the knot I would need to tie. And so my hands are free in following this pattern in a way they could never be without it. The rope isn’t heavy lifted in sections, but it carries the weight of responsibility. It feels rough, passing through my fingers, solid and strong. With eyes trained above, I don’t watch the rope, but I feel every pull and lift and bend with my neck, my shoulder, my arms, my hands, all the way down to my fingertips. They open slightly, slide, tighten, pull. Like familiar moves of a dance you love. And all the while, my right hand never leaves the rope. 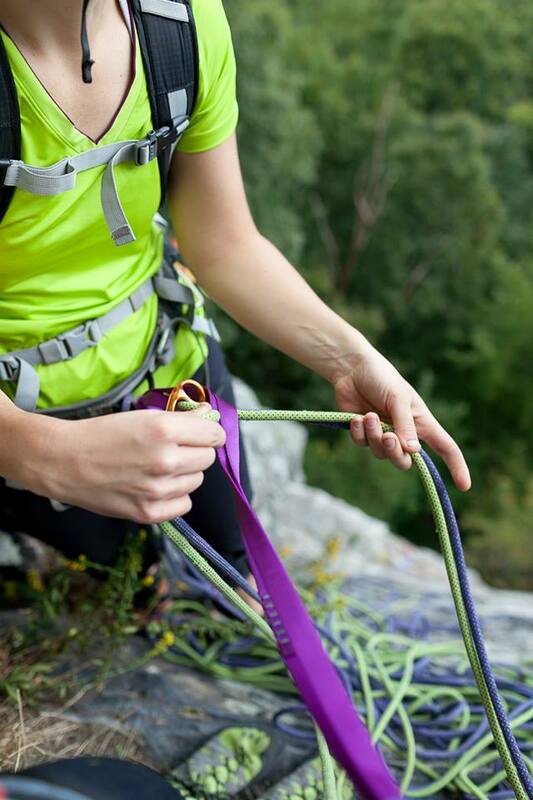 Not until the climber I hold is safe, attached to another anchor. Only then does every muscle loosen. I look down and open cramped hands to see the blackness the rope has left as it passed through. Not heavy, but I bear its weight. We dangle off the side of the rock, a hundred feet below and a hundred feet above. No way to get where we are, no way to get where we’re going, except to climb and depend. 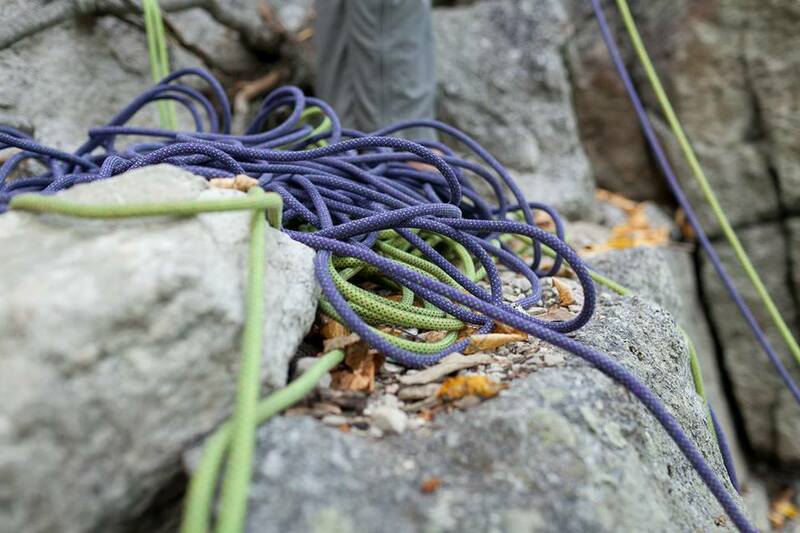 My feet push off the wall in front of me, the purple webbing that holds me to the rock taut as a bowstring. I crane my neck to gaze at where the ropes above us disappear over a ledge and into an expanse of sky. Somewhere beyond the ledge he is climbing, and I belay, without words, without sight. Just a rope through which to communicate, and a constant readiness to hear him with it, and if he needs it, respond. As I hang in trust off his anchor, he trusts my hands, guiding the ropes and dropping them into the expanse below us. I will ask much of my hands today. If not holding rope, they are gripping the rock. Sometimes my fingers wrap around a hold, steady in its solidness, while other times I am holding on barely by tips, clinging desperately, every tendon screaming. They may give at any moment, callouses scraping off the rock. My arms may fail, unable to pull my weight as high as I ask them to. My toe may slip off the tiny crack it’s wedged into. But you don’t think about falling, you think about climbing. And more often than not, that tiny crack and fingertip hold prove more than adequate if I trust them instead of my strength. My hands reach back to the chalk bag, more routine than necessity sometimes. The fine dust sifts through the air, marks my path up the rock, and adds its white stain to the indelible imprint of the day. Broken nails and dirt, scraped and bloody knuckles, white powder caught in every crevice. They’re not pretty, but that’s because they were useful. I will gladly bear the scars of usefulness. I may not fall, you know. I may never need the rope. But I could not climb without it. Its hold gives me freedom. Its knowledge, confidence. I need the hands that hold the rope. They free my hands to trust the holds provided by the Rock for this climb. I try one last climb, and she steps in to belay. I am tired. I can’t give what I need to win this fight. Not today. Again and again I fall, dangling from the rope, looking up at the move I cannot make. As I fall, she catches me. As I swing in the air, she holds me. 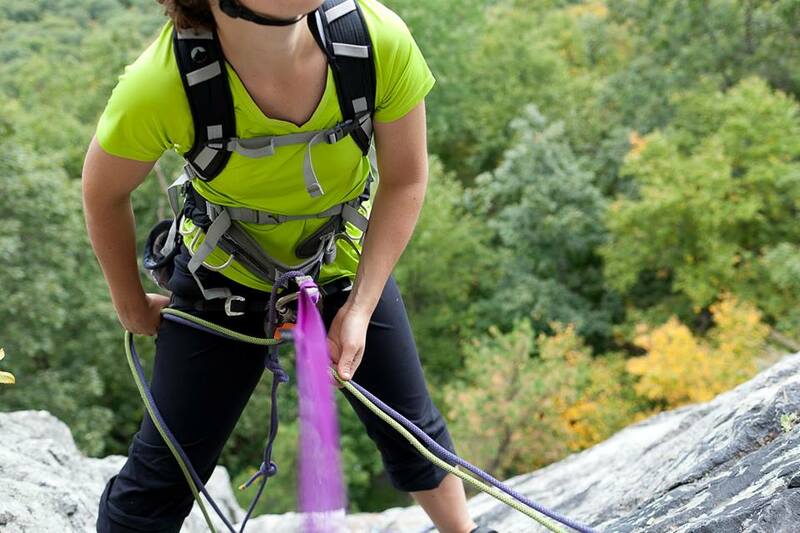 So intent on the climb, I am not even conscious of the rope. I have no fear, and no doubts. It isn’t until returning to the ground, actually, that I turn, look, and really see. She’s loosening the rope, un-clenching her hands. And I am thankful. We take the ropes down. I coil one in loops, feeling the reality of its weight as it is concentrated entirely on my shoulders. Dusk is falling and in the shadows the day is beginning to blend into memory with the rock face behind us. My hands are tired. My body is tired. Life is often heavy. But in this reminder of simplicity, my heart feels light. 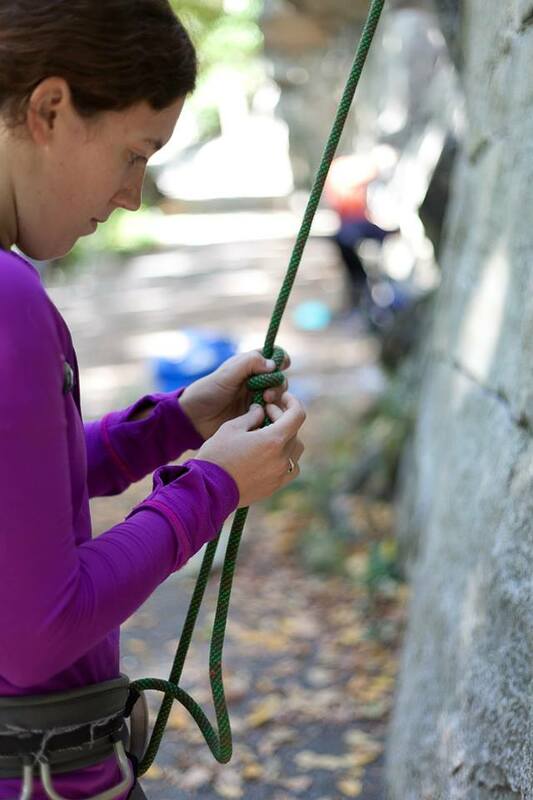 We climb and we belay. We succeed and we fall. We hold each other’s ropes in our hands. The climb continues. The effective, fervant prayer of a righteous man avails much. Tags: climbing, friendship, prayer | Permalink.